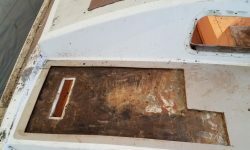 I wanted to extend the cutout on the port sidedeck a bit forward, into the original portion of the deck, to see what the transition area was like (between the previous repair and the original) and to better judge the condition of the coring immediately adjacent to the areas I’d removed before. 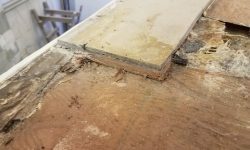 In this area, I expected the core to stop well short of the deck edge roughly 7″ inboard, so I made my new cut accordingly. 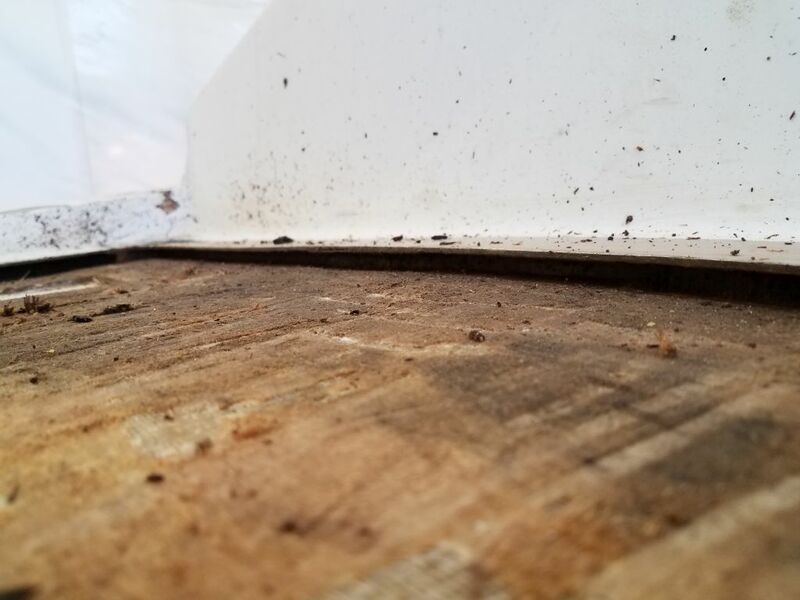 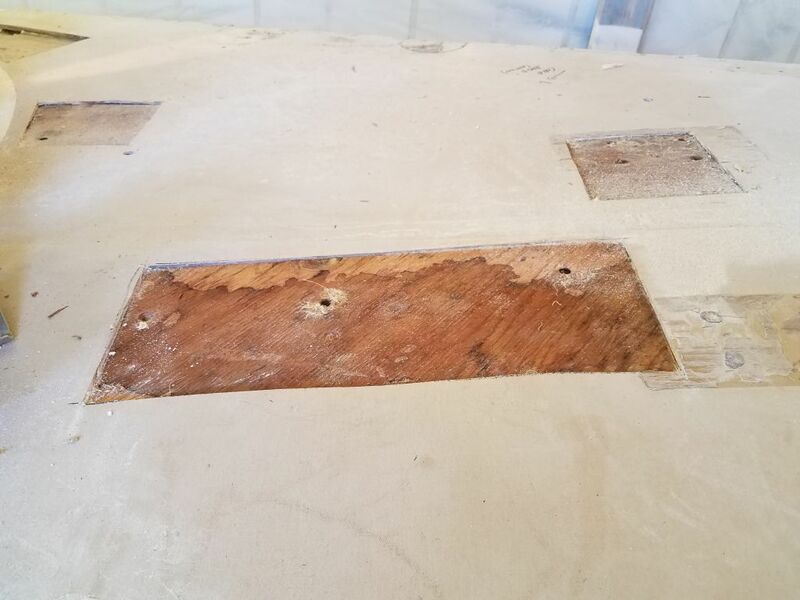 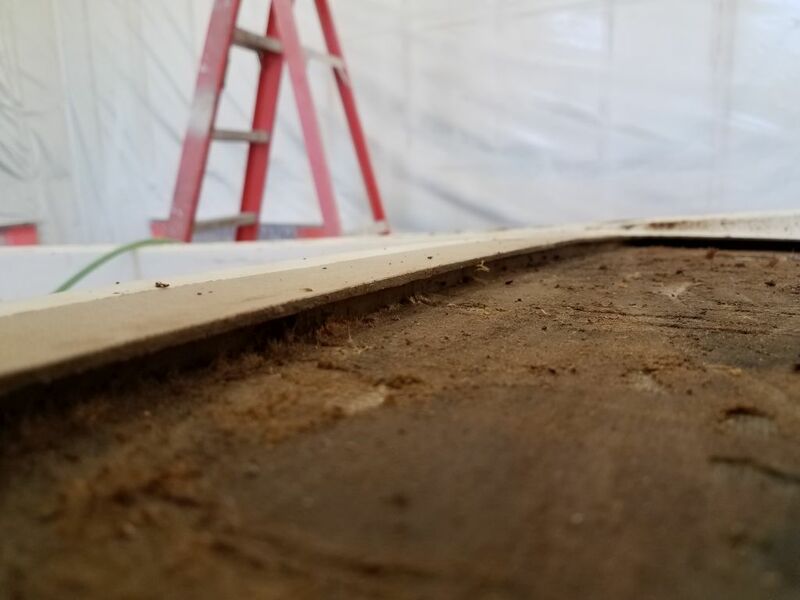 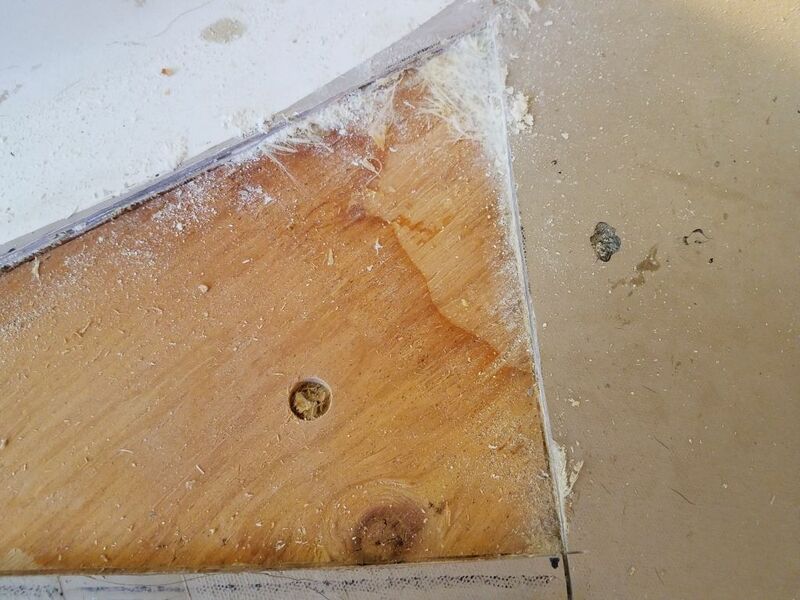 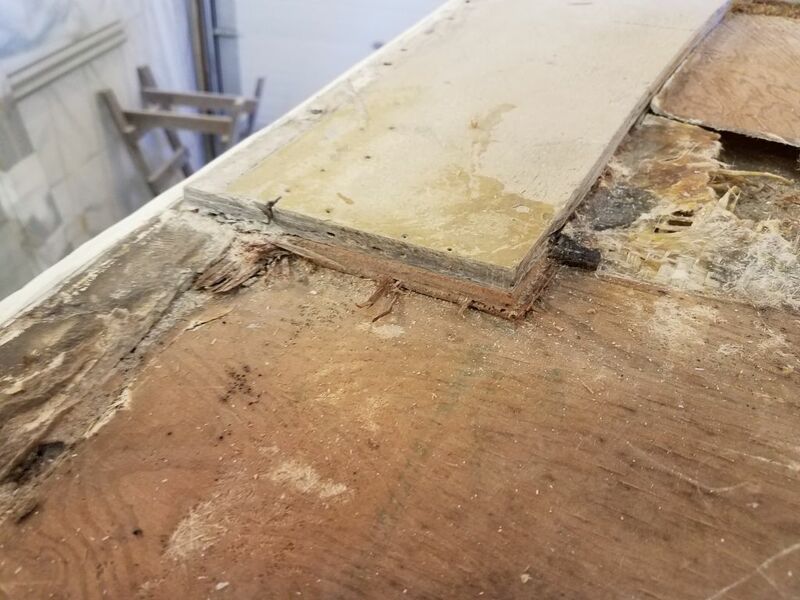 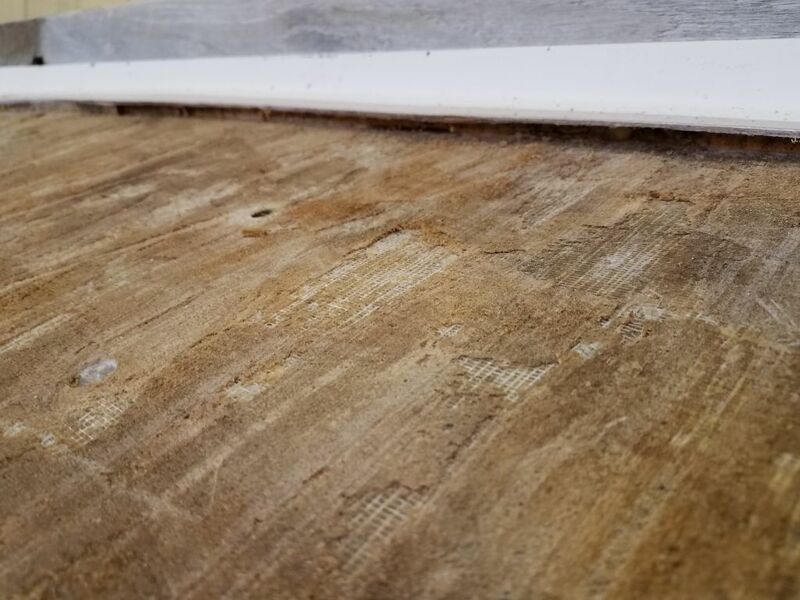 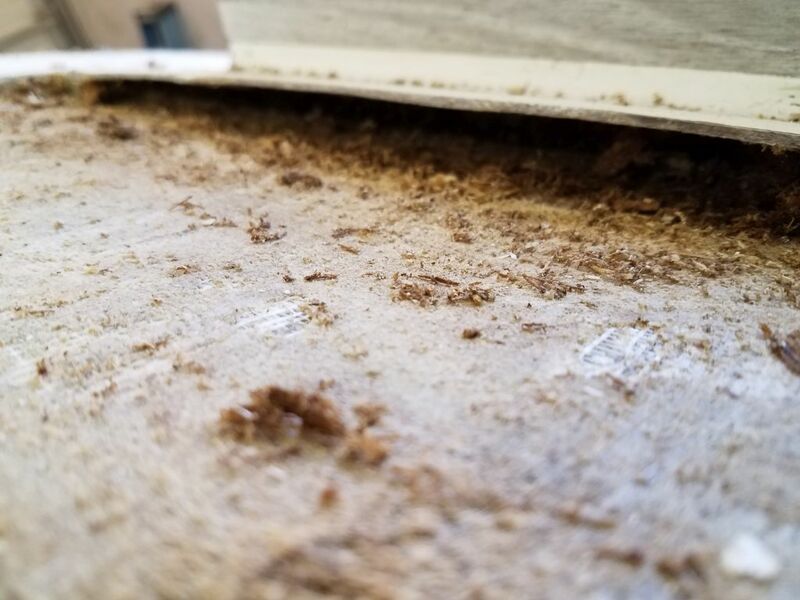 Here, at least, the top skin was still adhered to the plywood core, and by the forward end of the cut the core was showing less in the way of water damage. 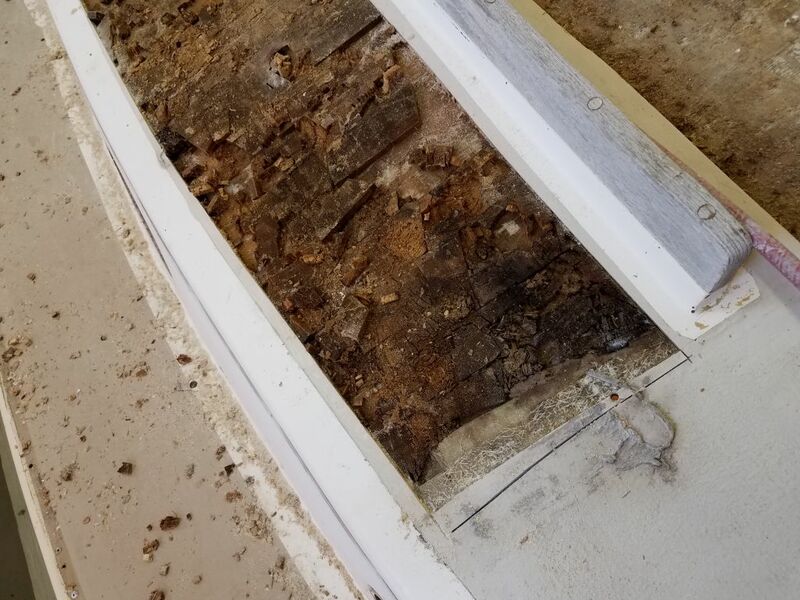 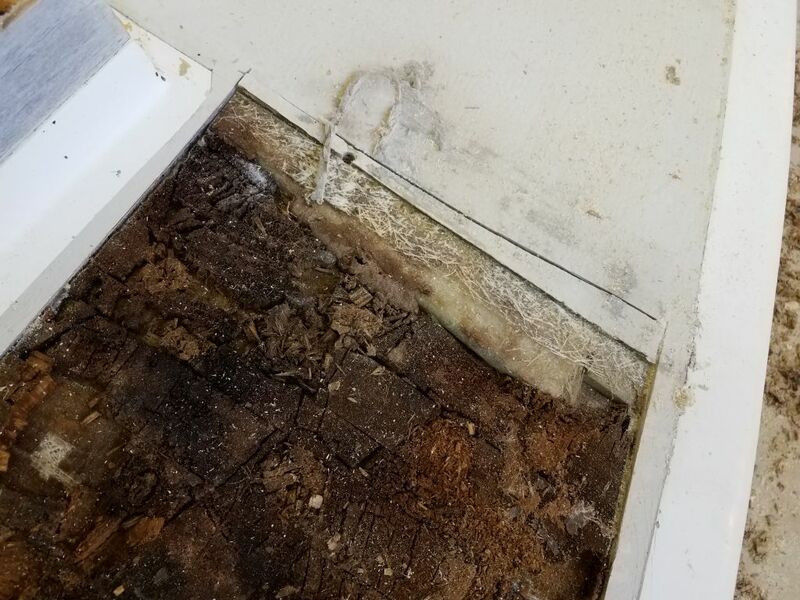 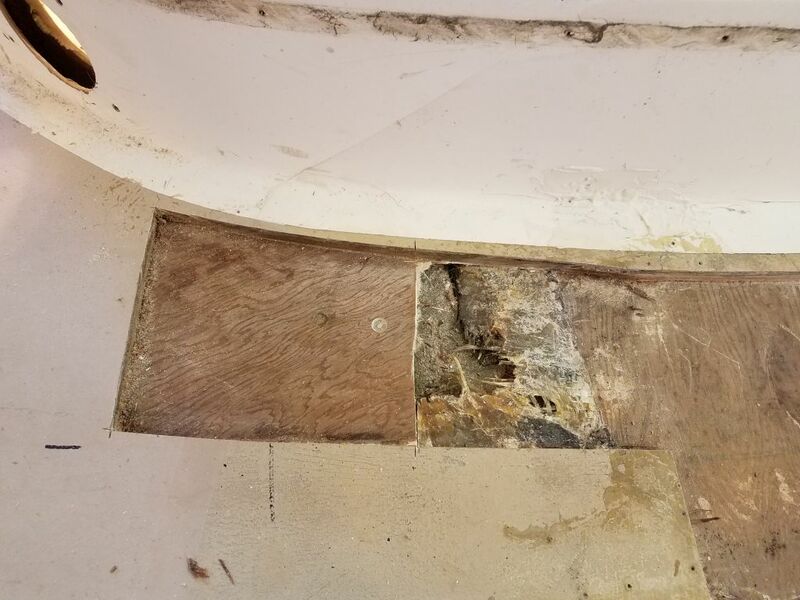 Removing the plywood from this section revealed the transitional area, which had previously been at least moderately reinforced from below, but I’d have to reconstruct the bottom skin over the existing area to better repair and strengthen the new work. 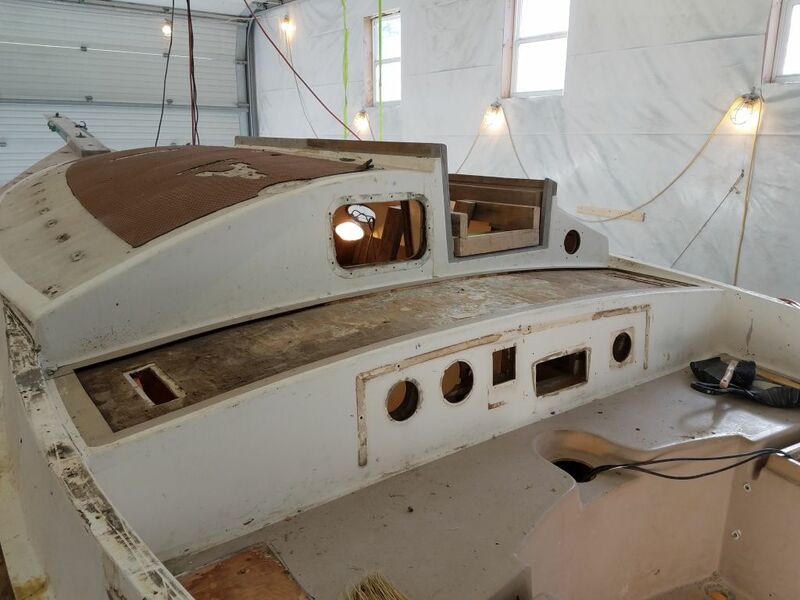 I’d tie this all in with the adjacent deck and hull as well. 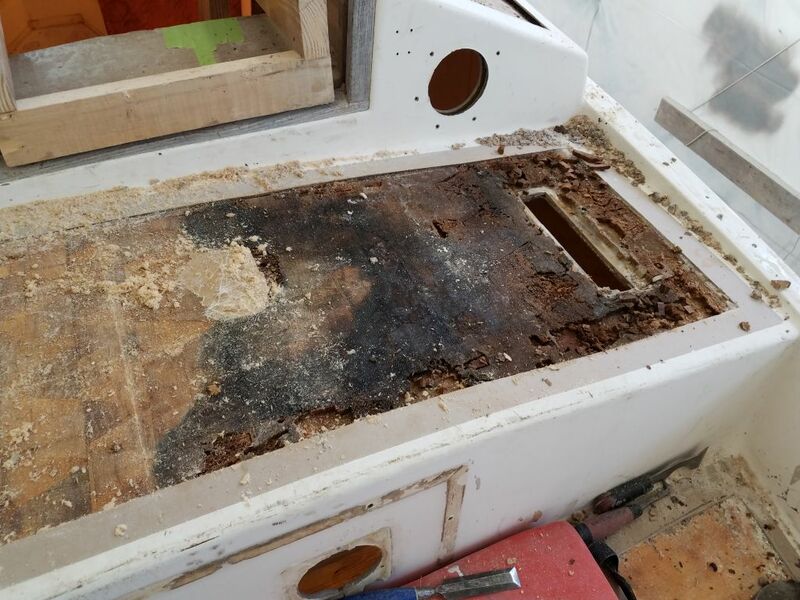 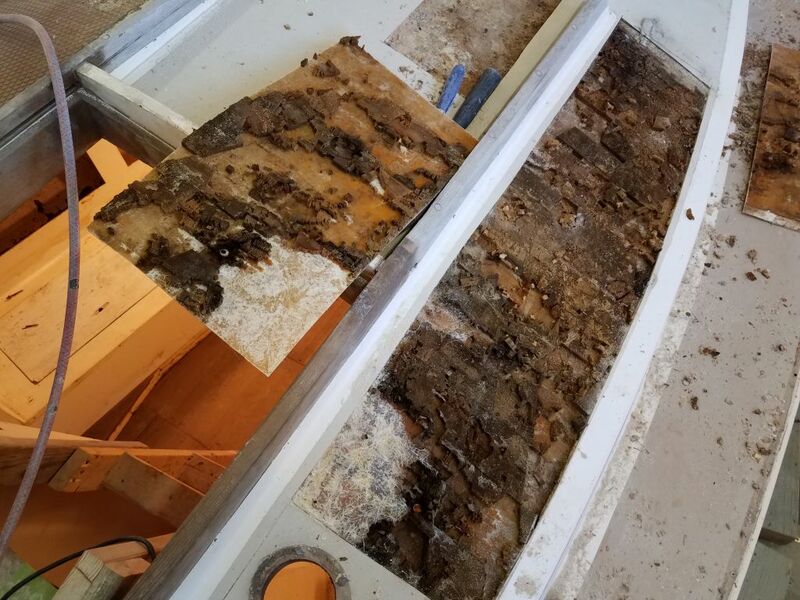 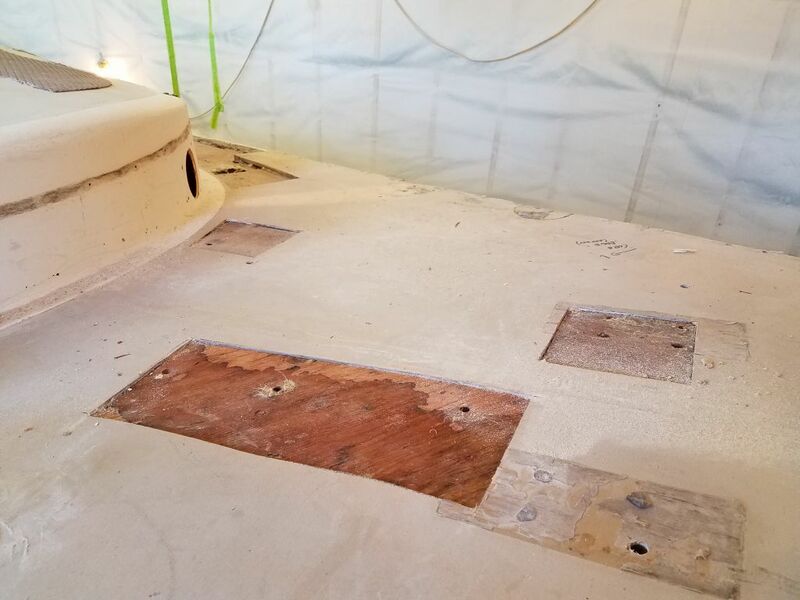 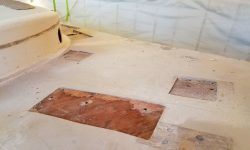 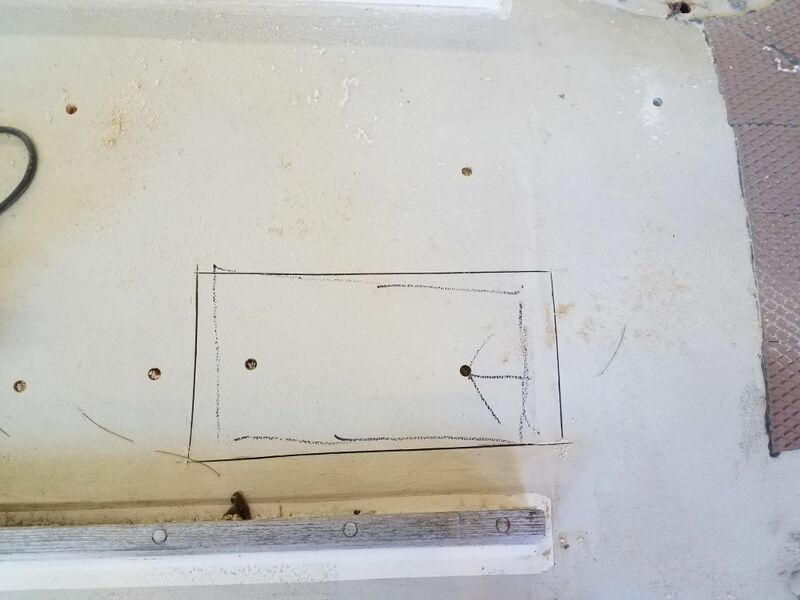 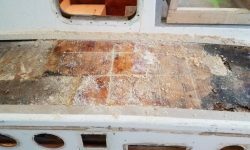 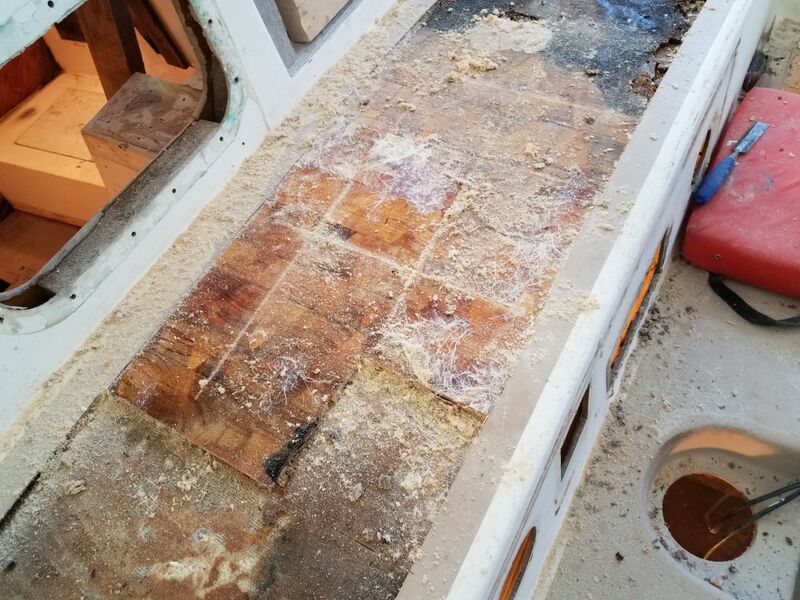 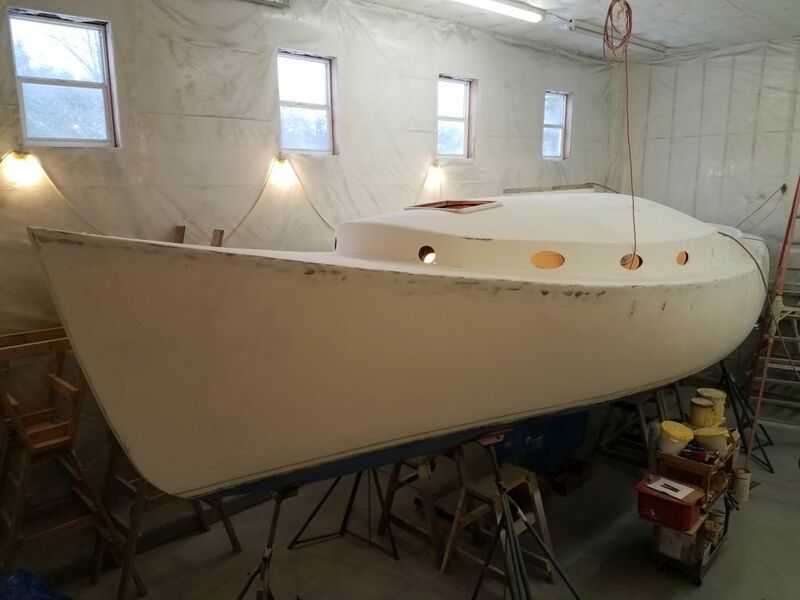 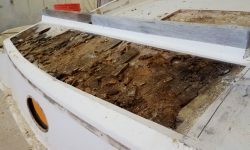 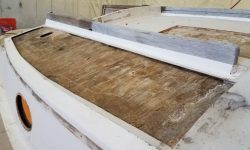 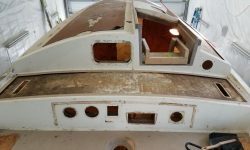 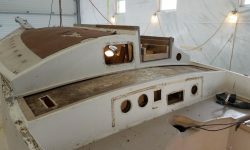 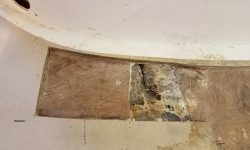 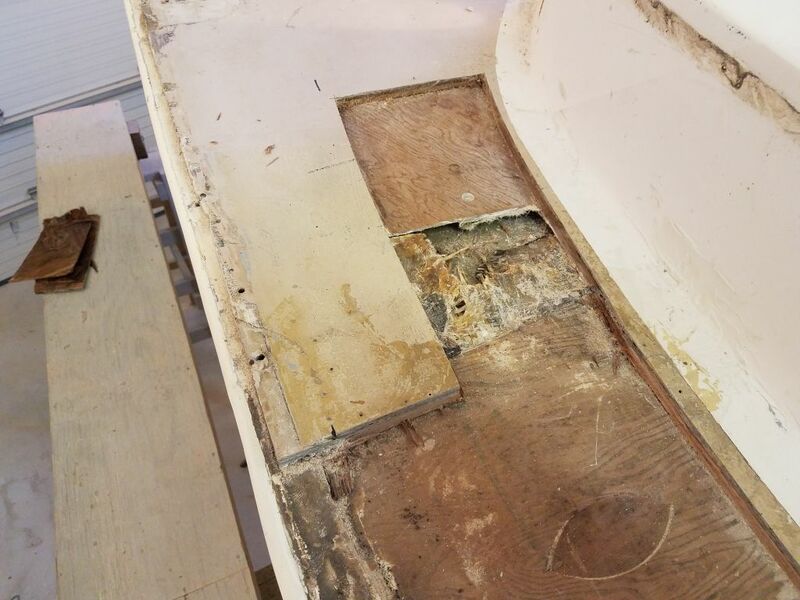 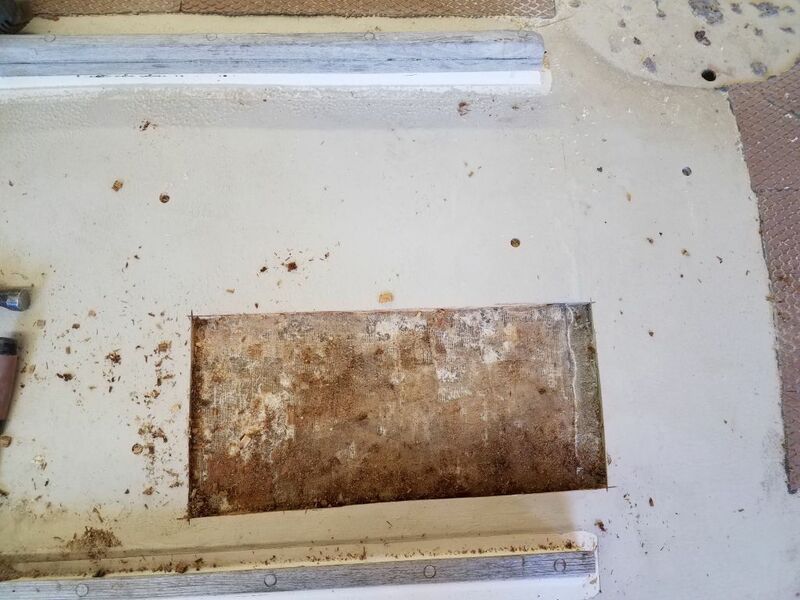 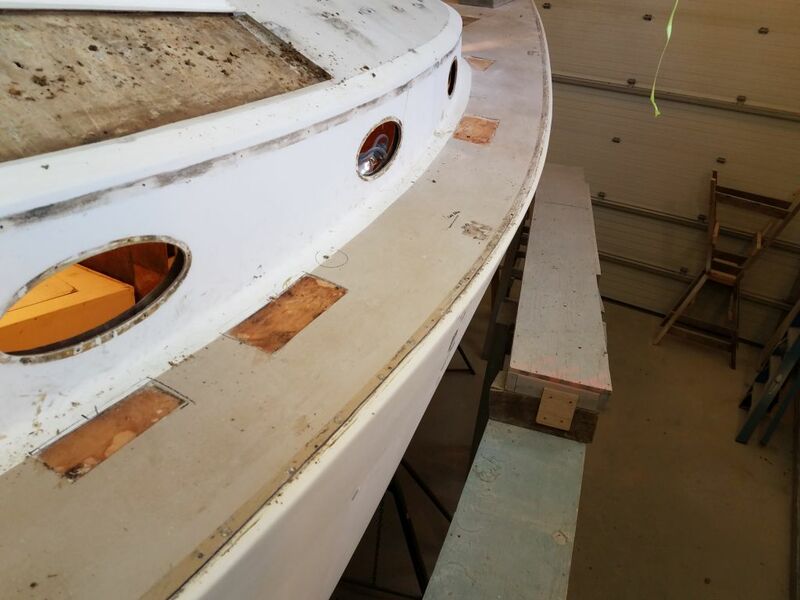 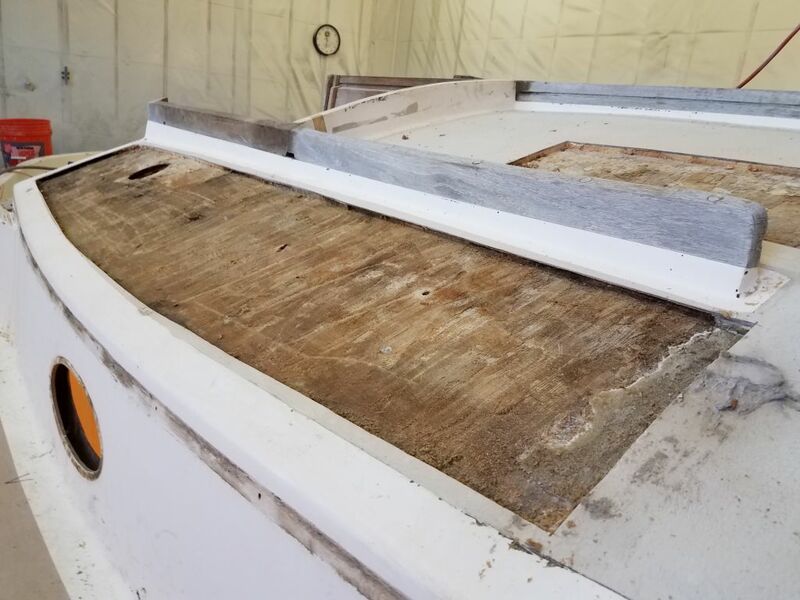 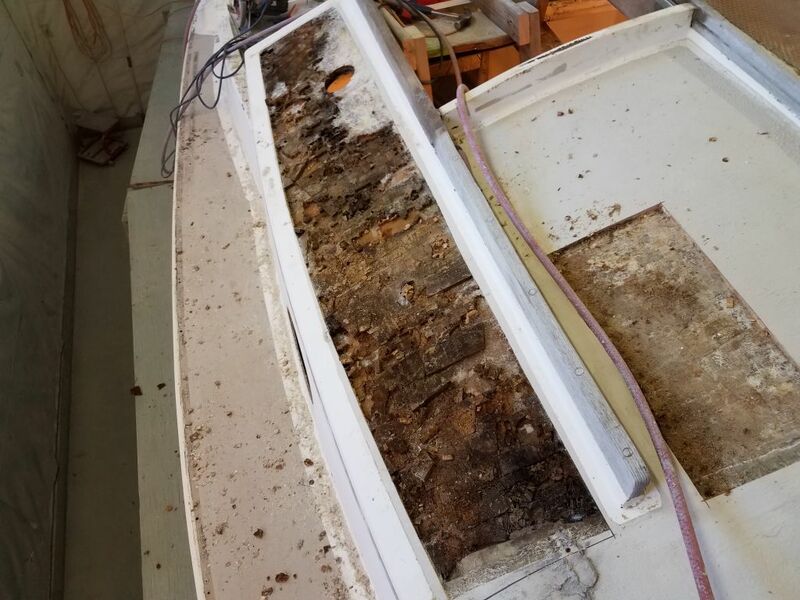 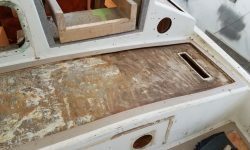 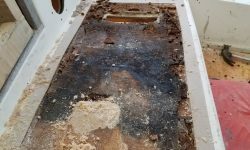 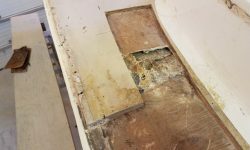 Moving to the starboard coachroof, I began by cutting open an area inside the companionway rails, leading aft from the section of the deck that had been rebuilt at some time in the past. 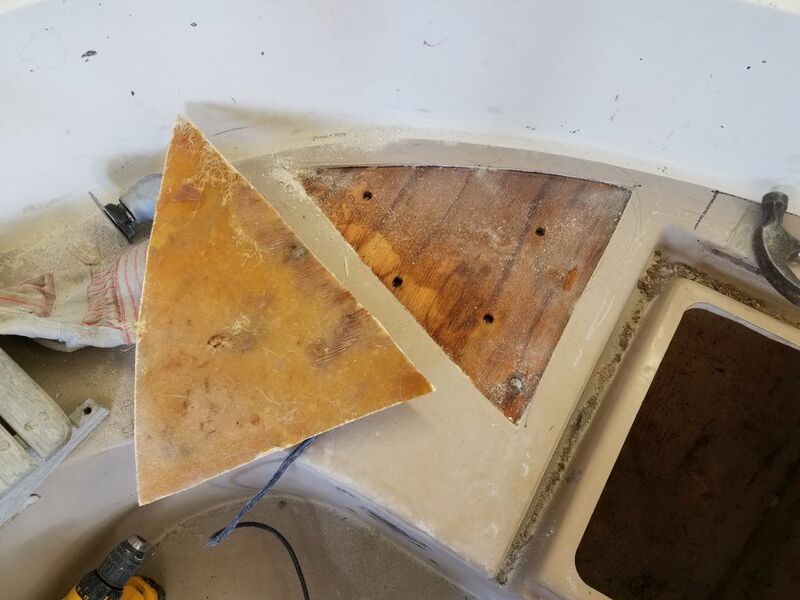 My initial cuts were a bit shy of running into sound core on the aft and inboard sides, so I expanded the area a bit till clean, dry core bordered the entire cutout. 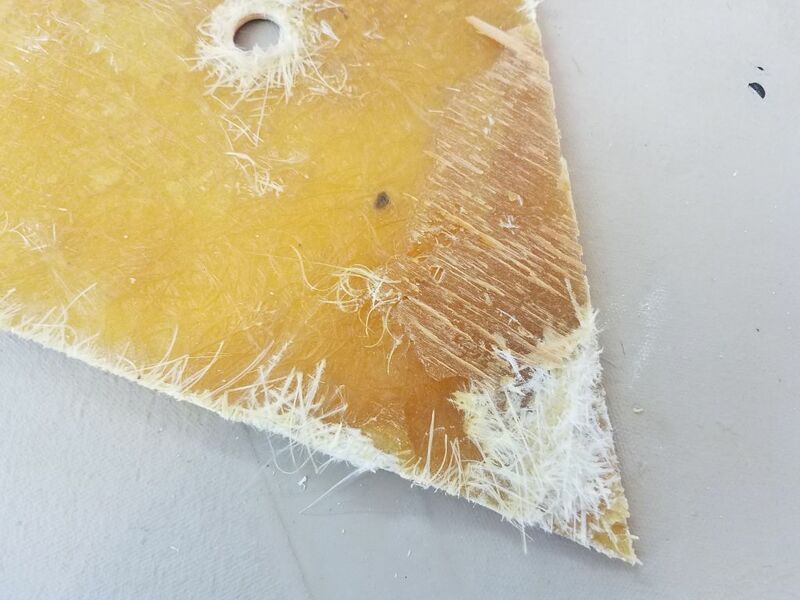 As expected, the balsa core in this area was in poor condition. 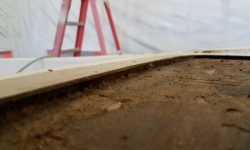 I intentionally extended my cut a bit forward into the newer work to help me judge the condition of that area as well. 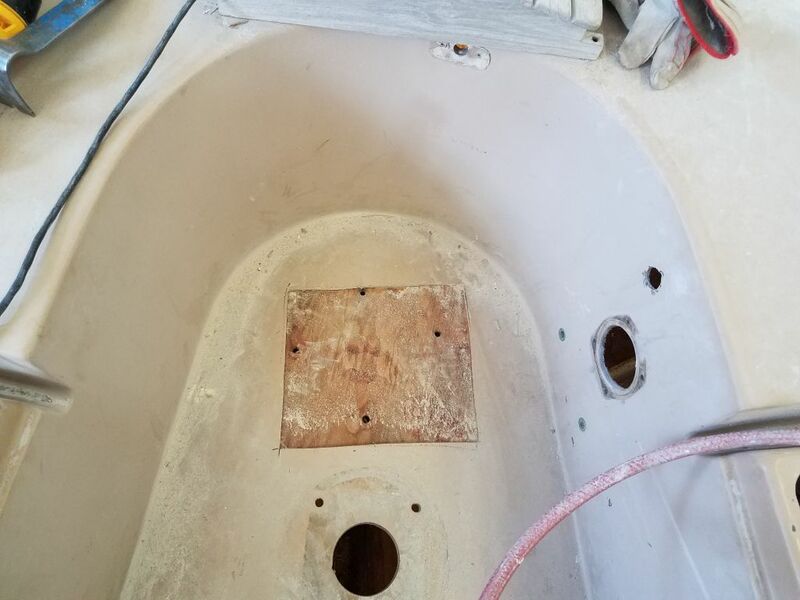 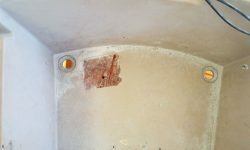 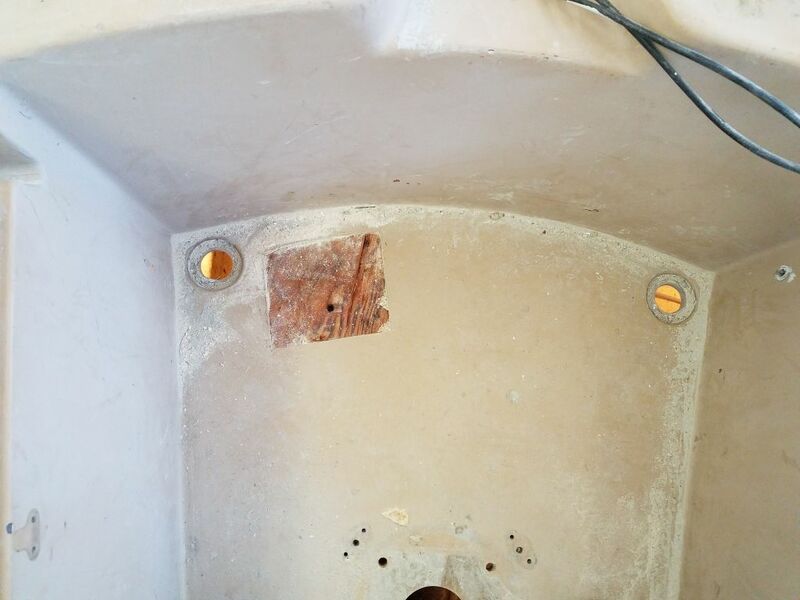 I removed the old core from the cutout, reaming it out of the slot on the outboard side near the companionway rail as much as possible. 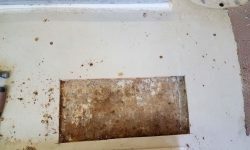 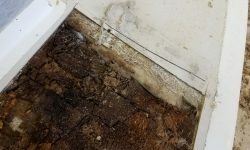 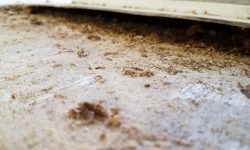 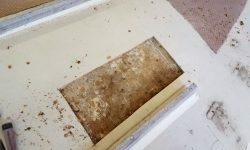 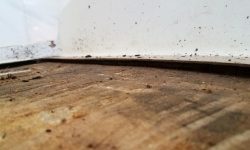 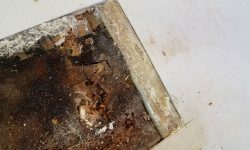 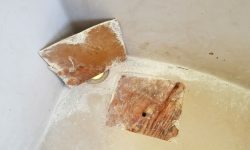 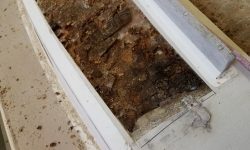 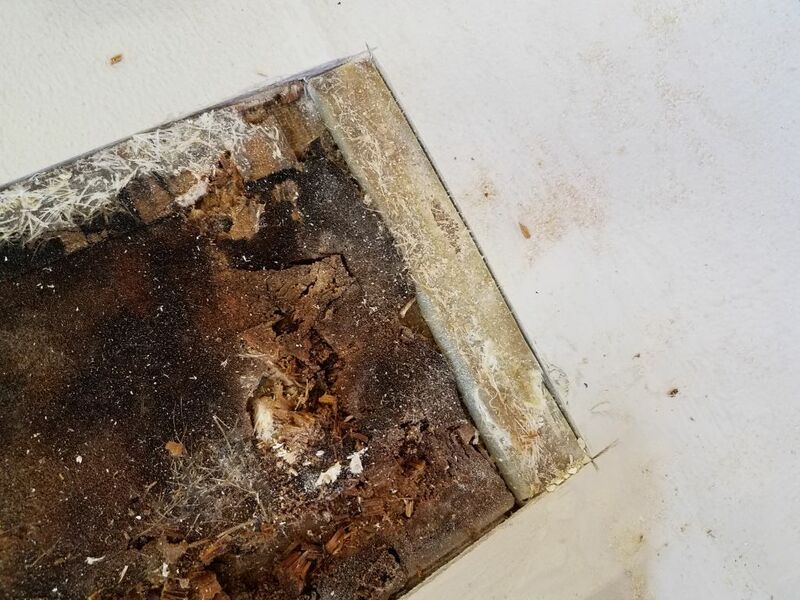 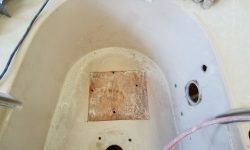 The core in the adjacent section was a foam product, probably Divinicell, and the good news was that at least in this small visible area, the core and top skin looked sound, belying the rough outward appearance of the deck itself. 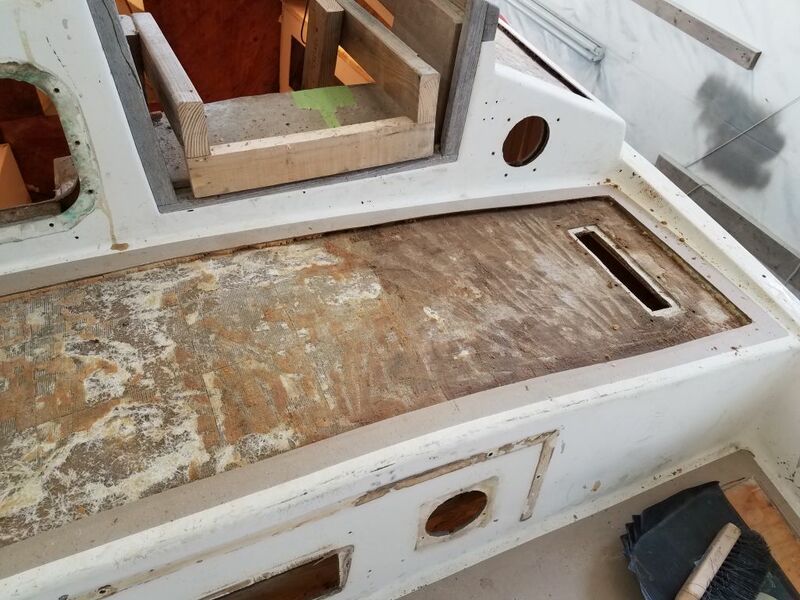 Next I cut the top deck skin outboard of the companionway on this side, removing the entire section. 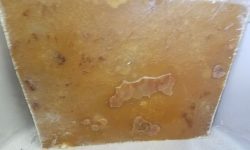 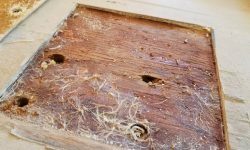 The core within was in extremely poor condition. 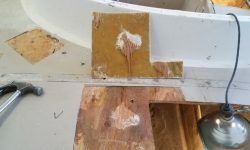 Again, I extended the cut an inch or two into the foam-cored section just forward, giving me another place to judge the condition and to better integrate the two areas during repairs. 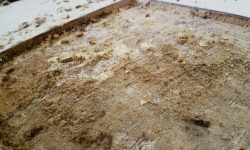 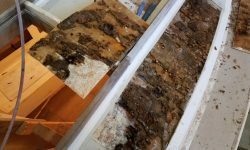 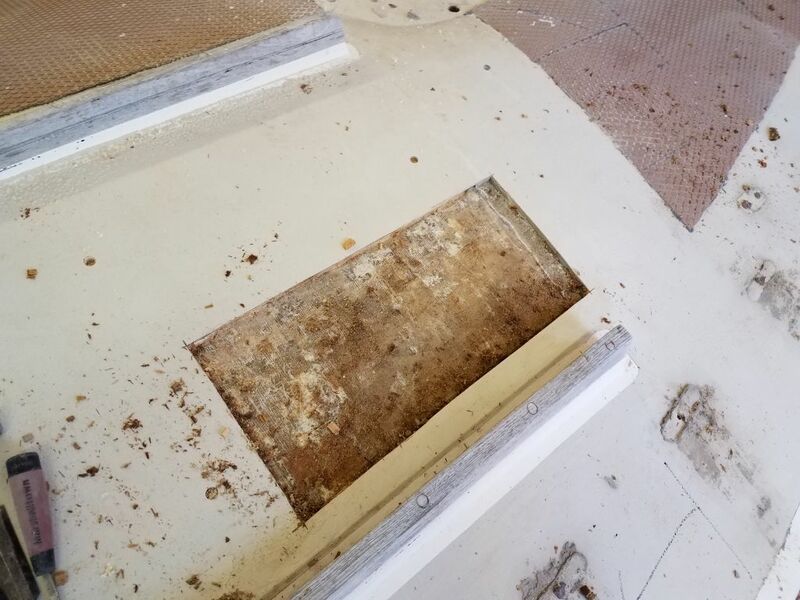 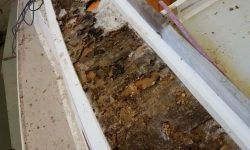 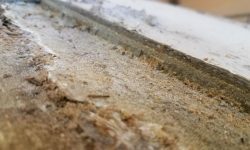 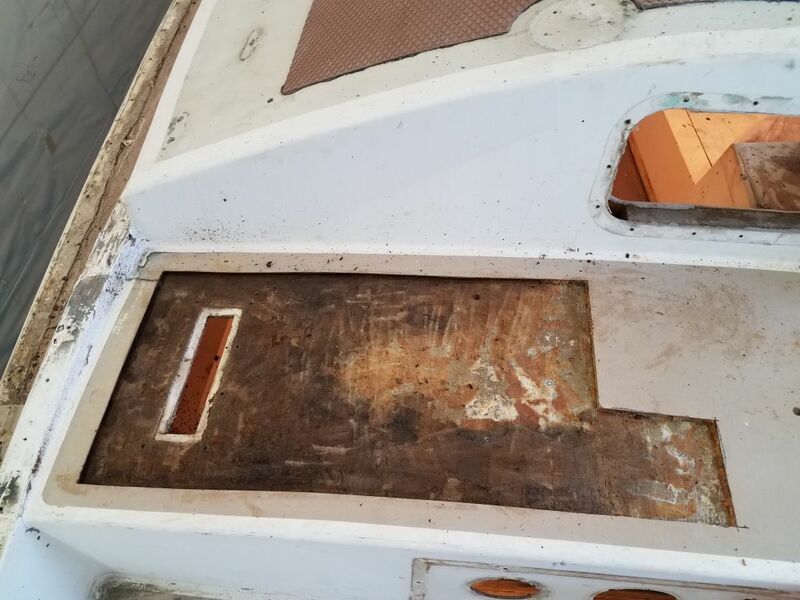 I removed all the coring from the newly-opened area, scraped up the worst of the residue left behind, and cleaned out the edges below the adjacent deck flanges as much as possible. 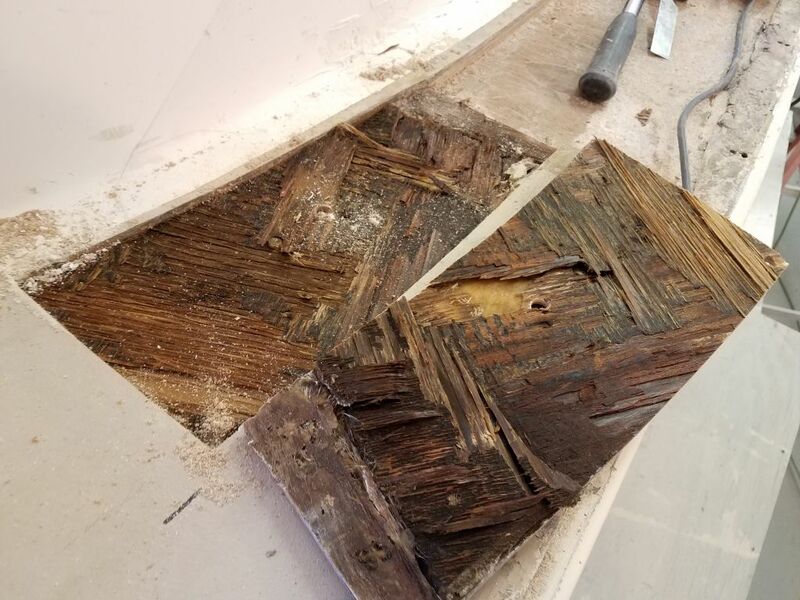 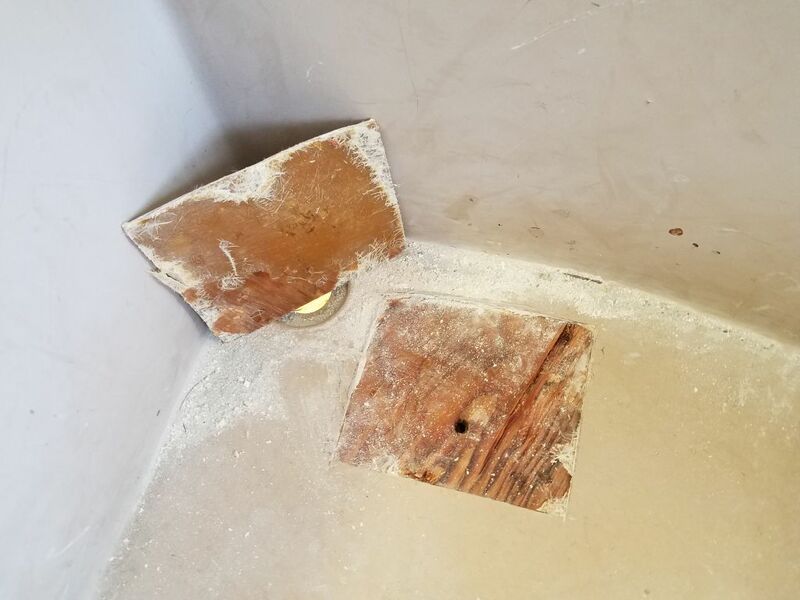 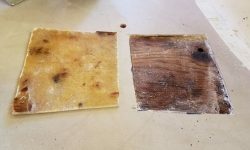 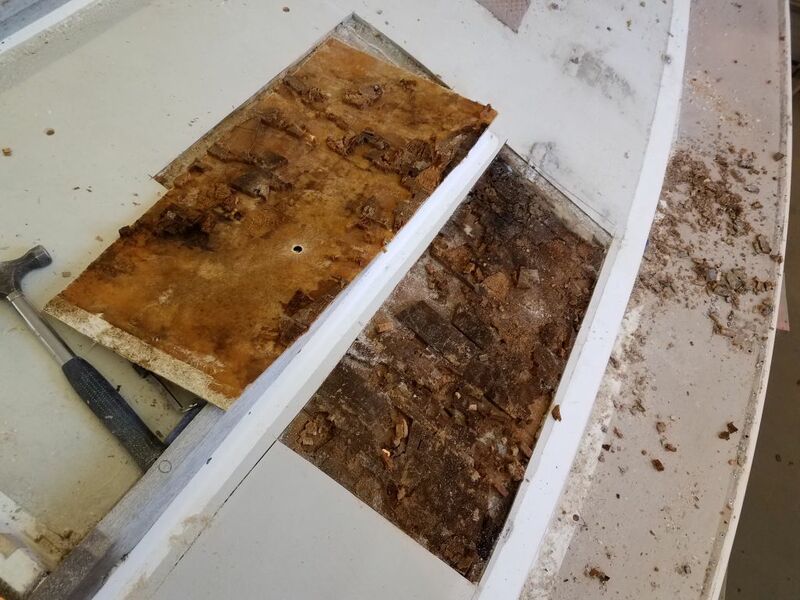 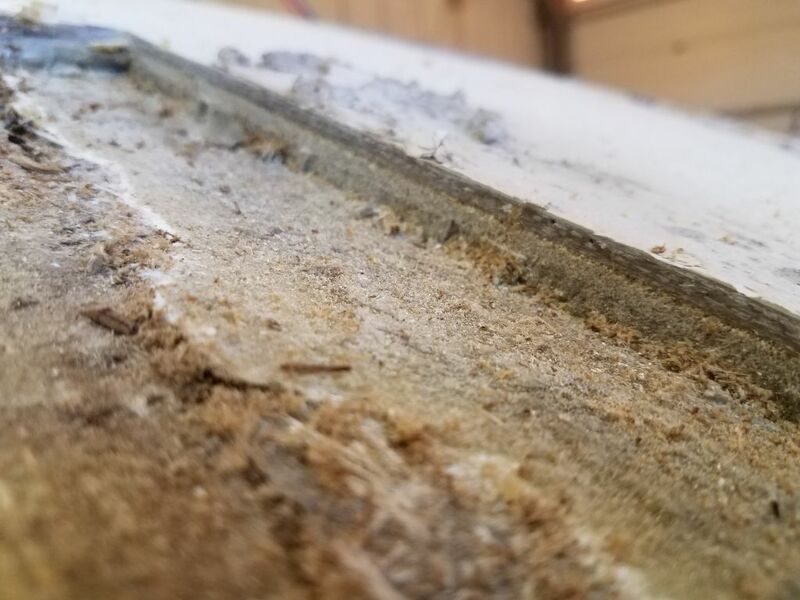 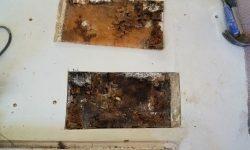 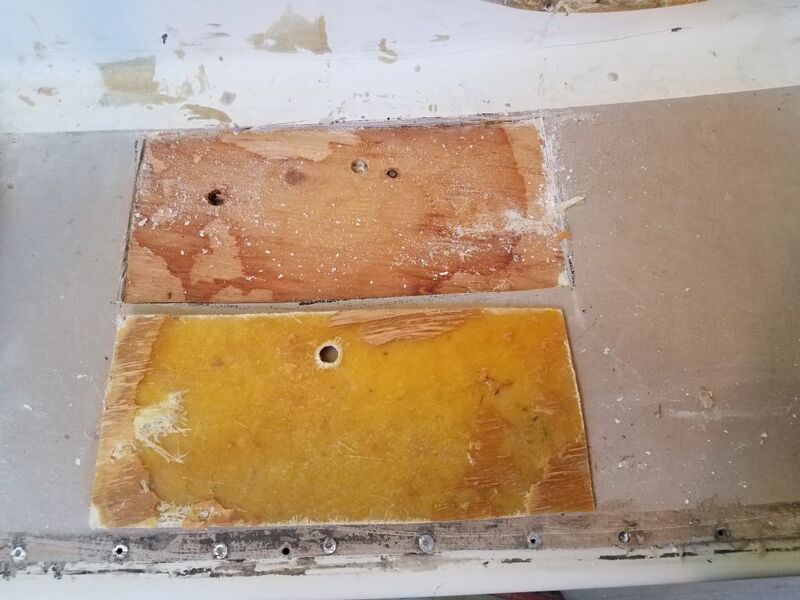 It’s worth noting that even given the poor and deteriorated condition of the balsa here, much of the saturated wood was more strongly adhered to the skins on either side (upper or lower) than the plywood on the port deck that I’d removed last time. 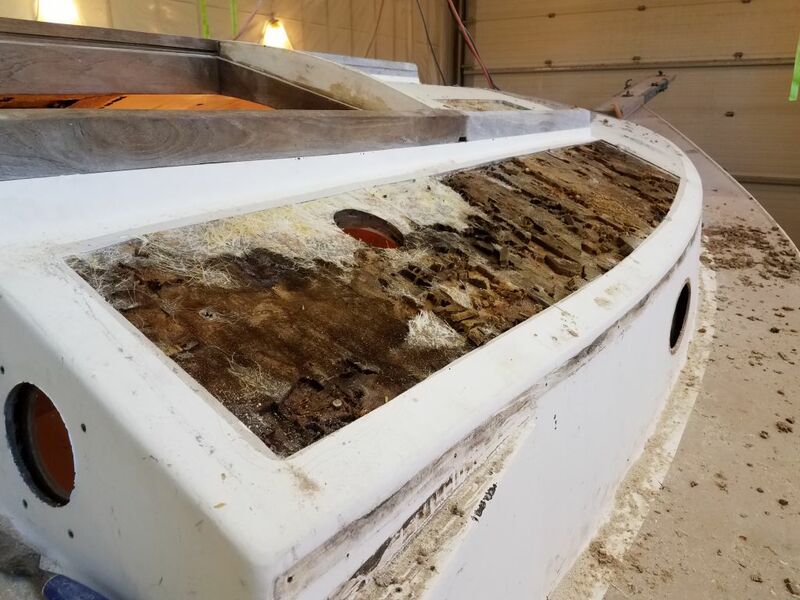 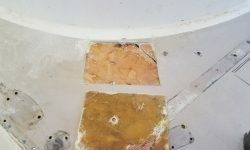 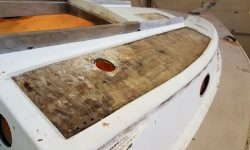 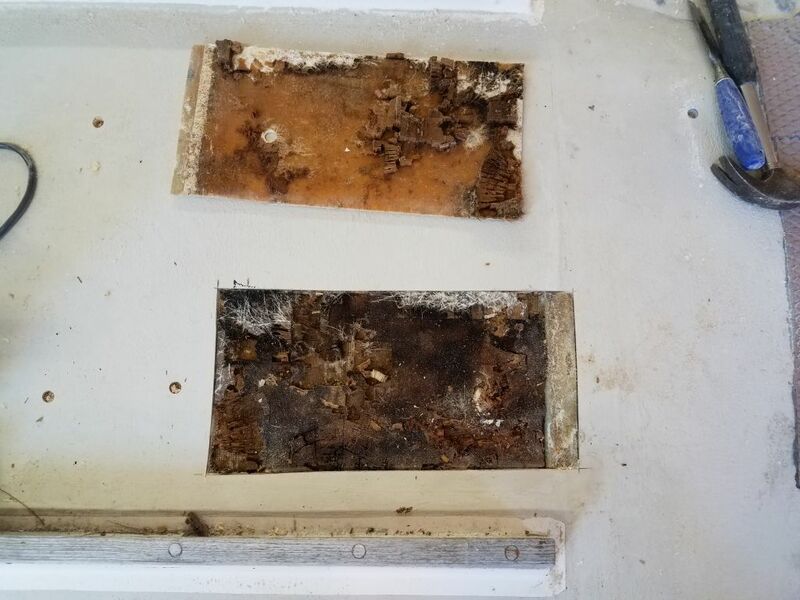 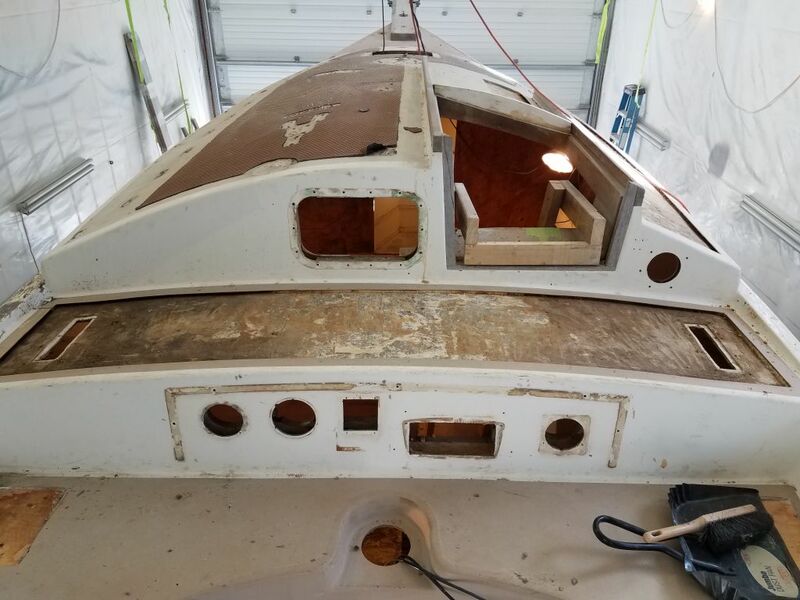 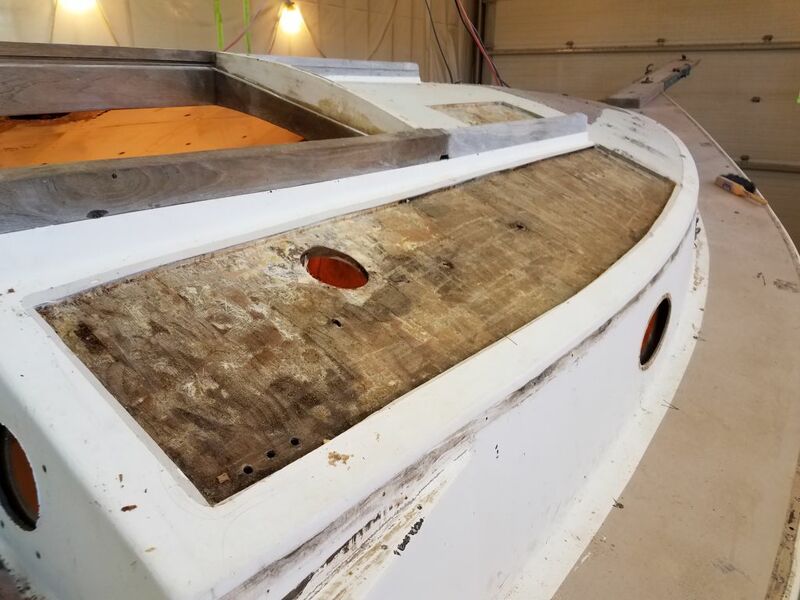 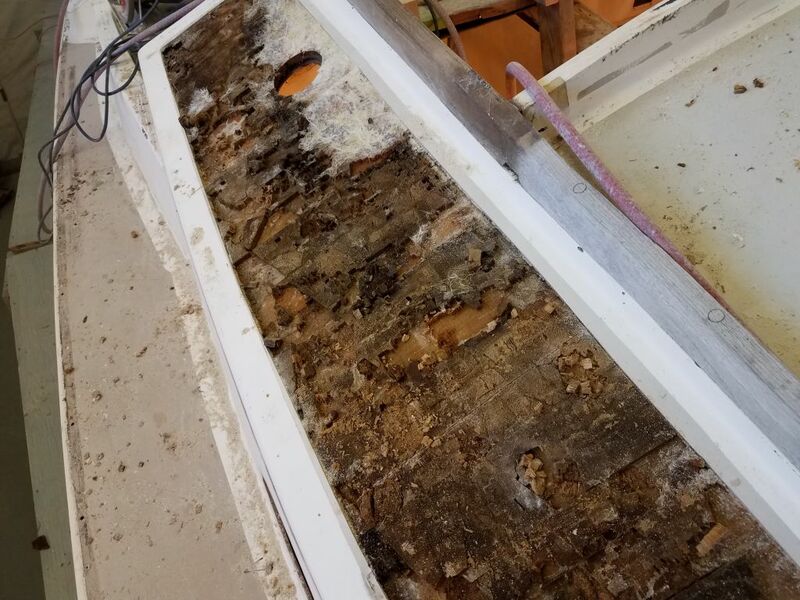 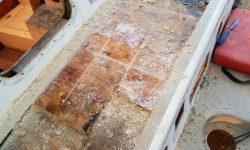 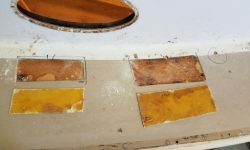 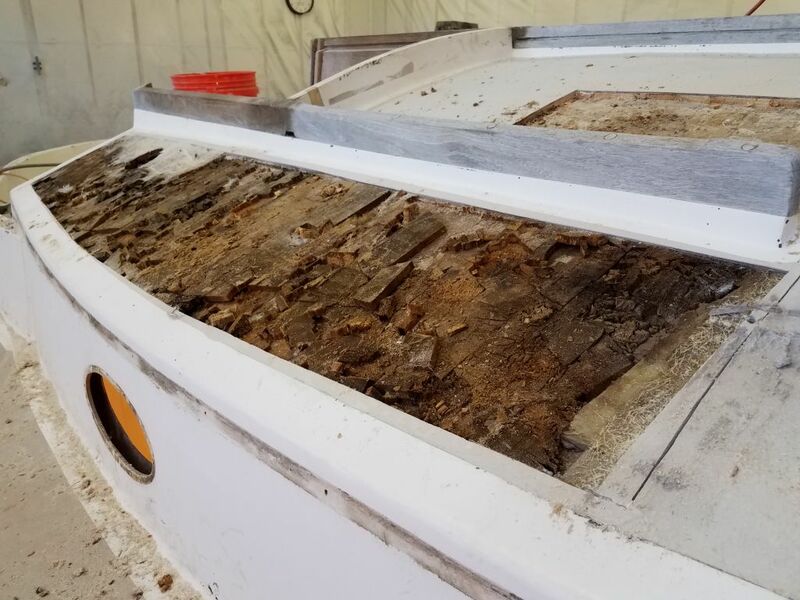 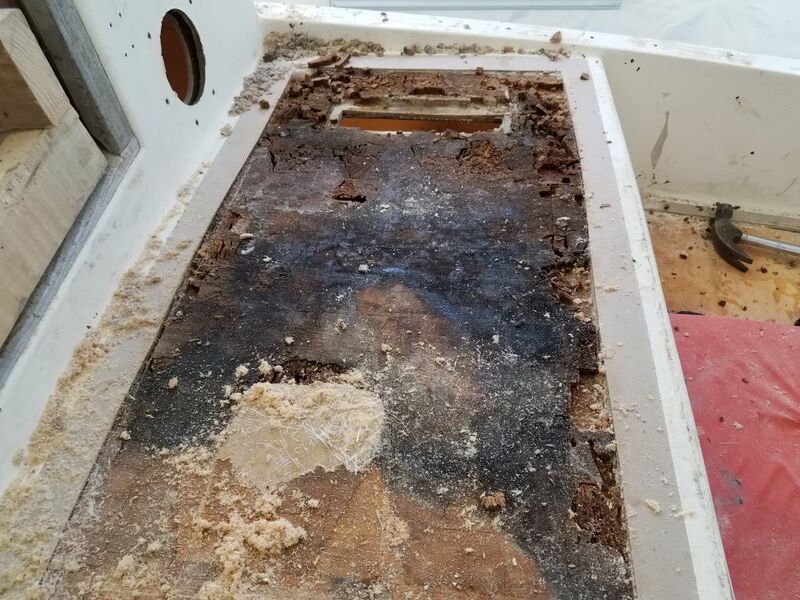 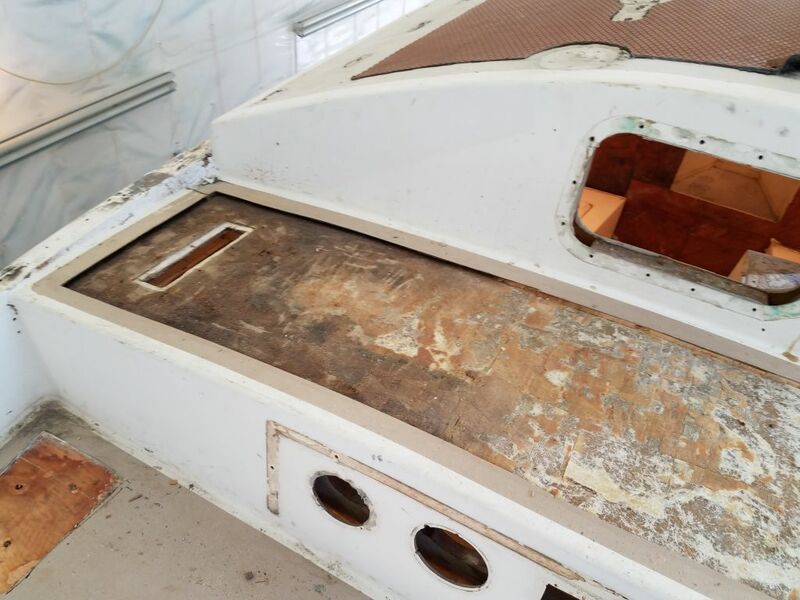 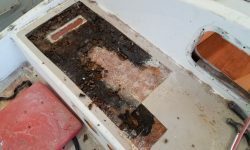 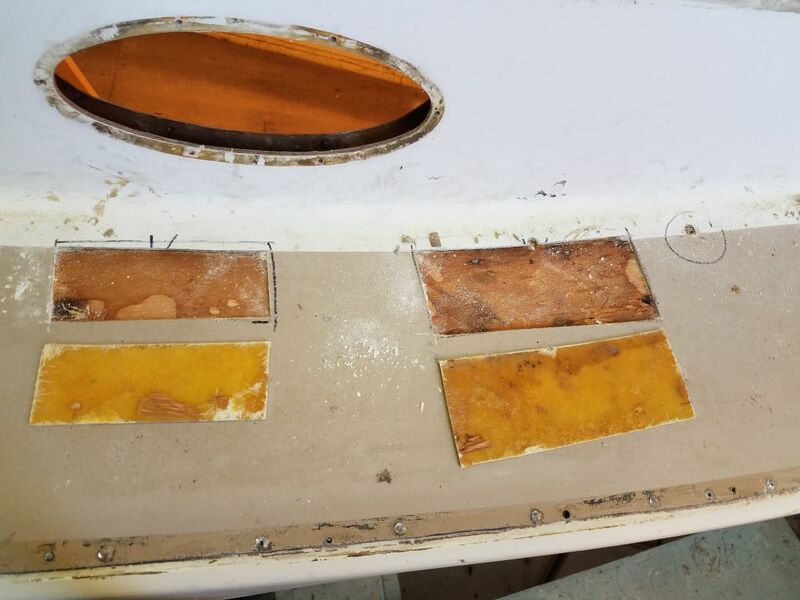 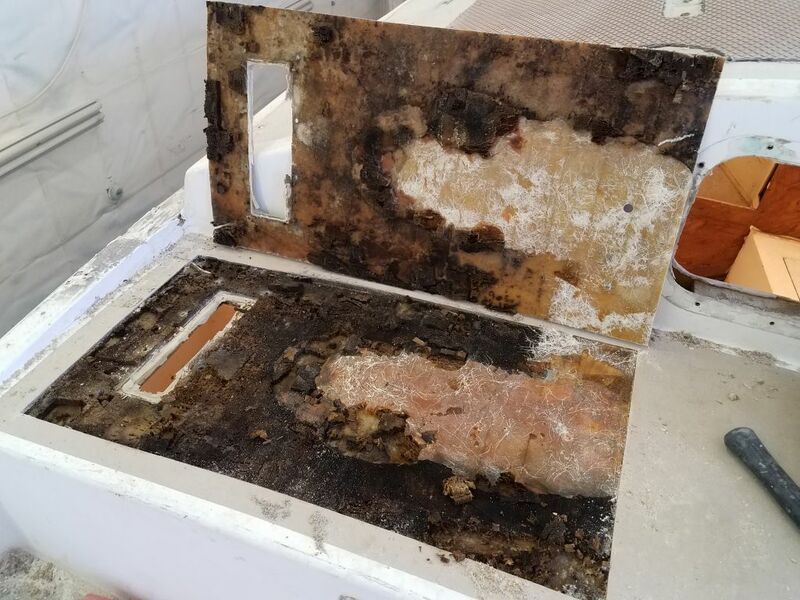 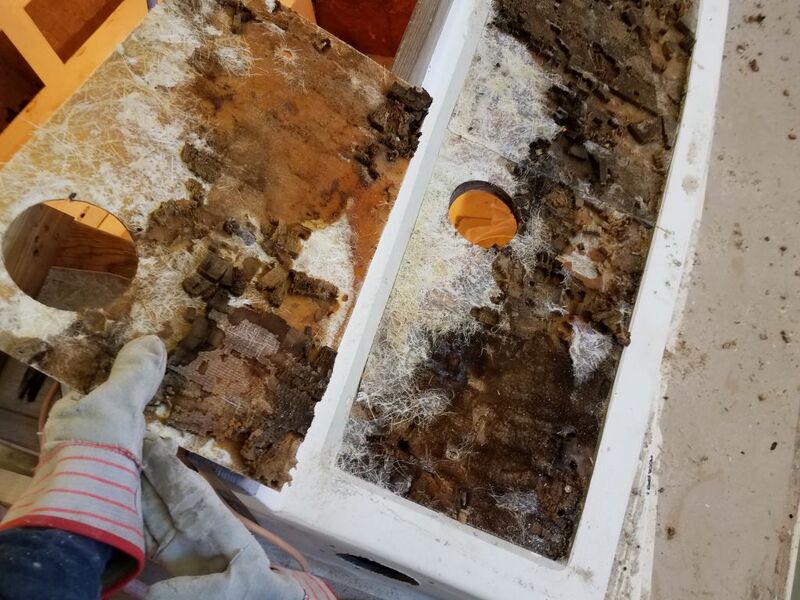 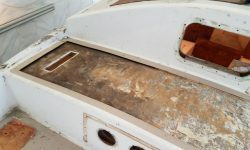 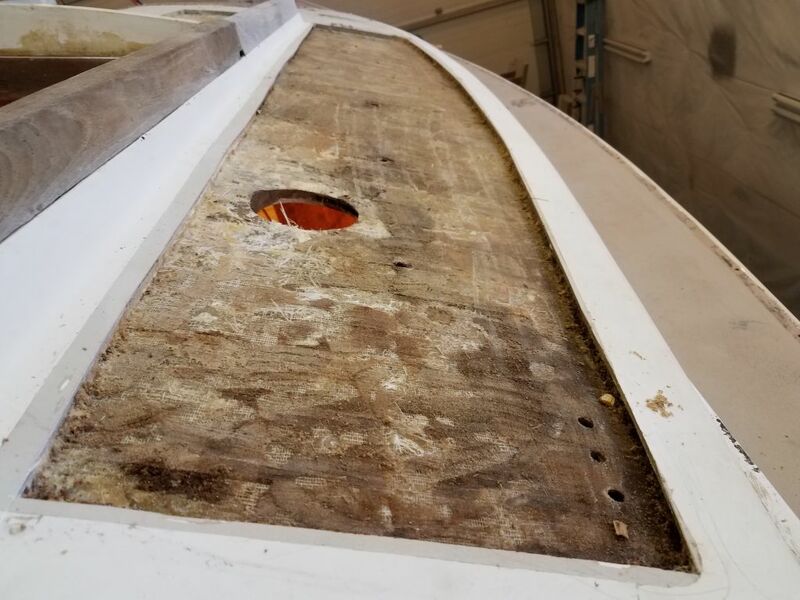 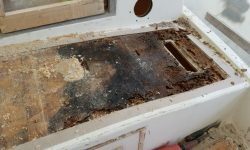 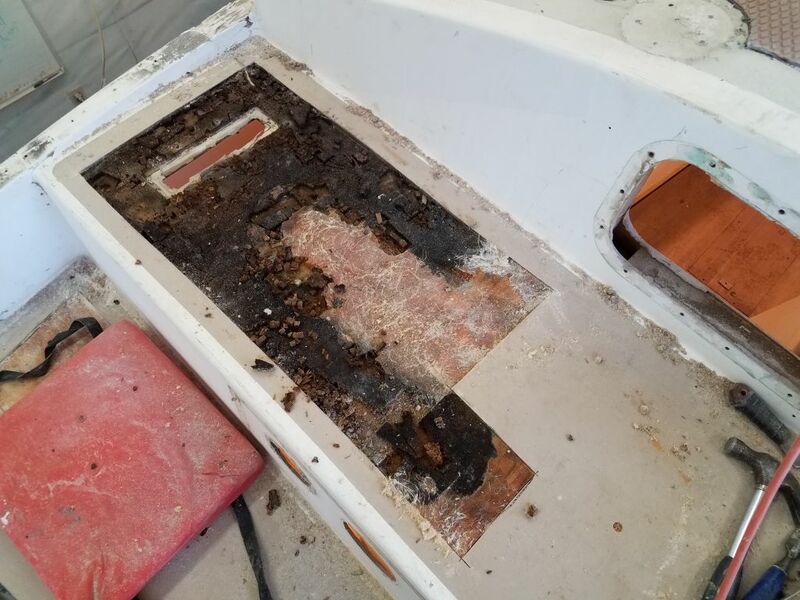 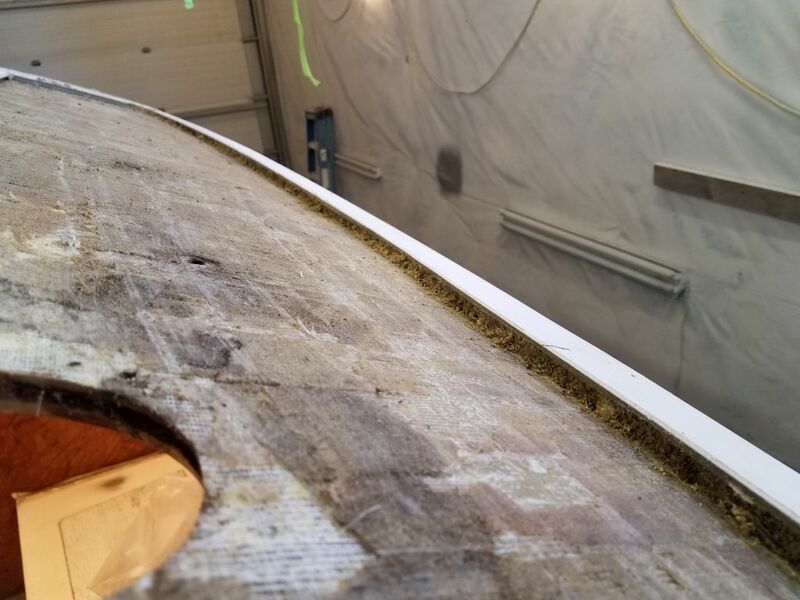 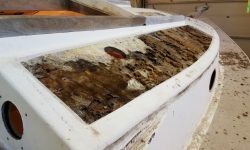 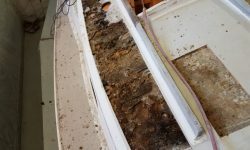 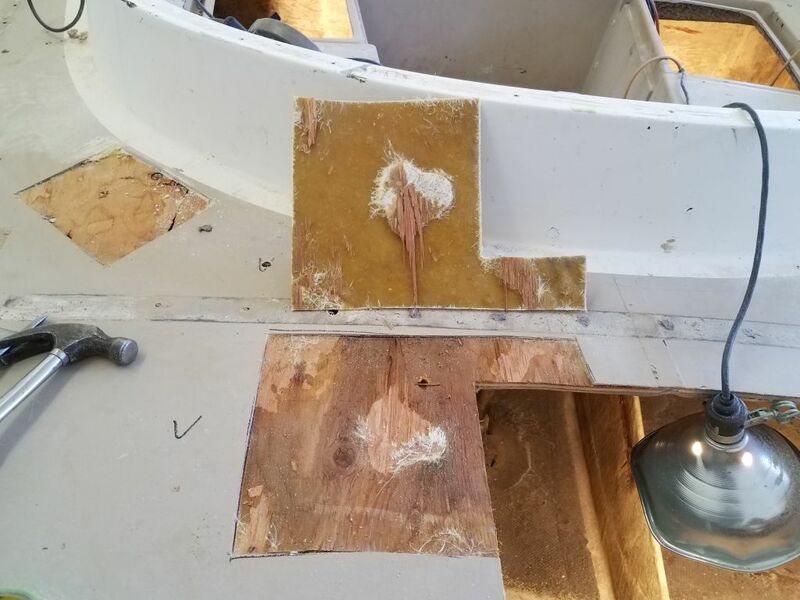 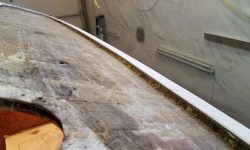 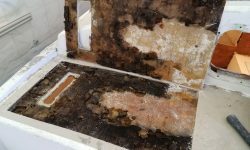 During the deck inspection, I’d found any number of small areas on the foredeck, starboard deck, cockpit seats and well, and poop deck (all original construction) where there was a clear separation between the top skin and core beneath (debonding). 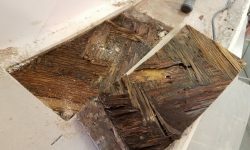 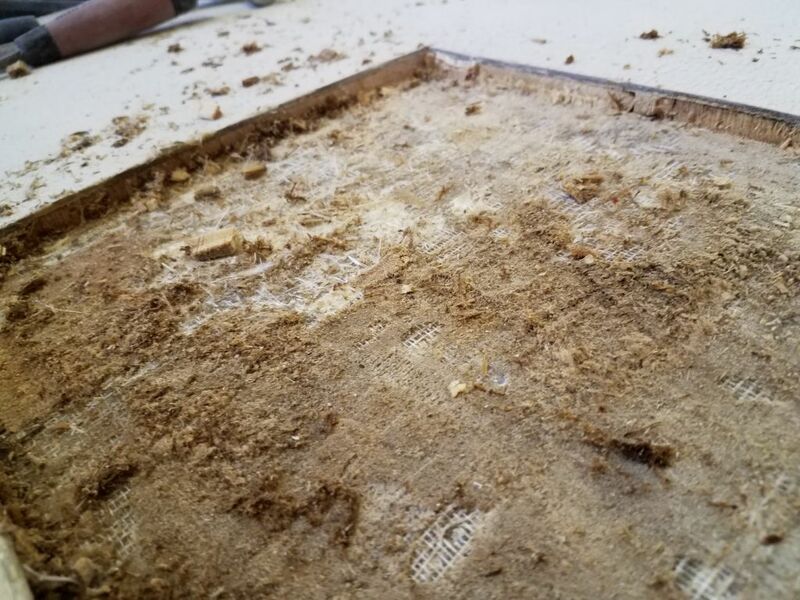 Core sampling in most of the areas revealed clean, dry core (plywood). 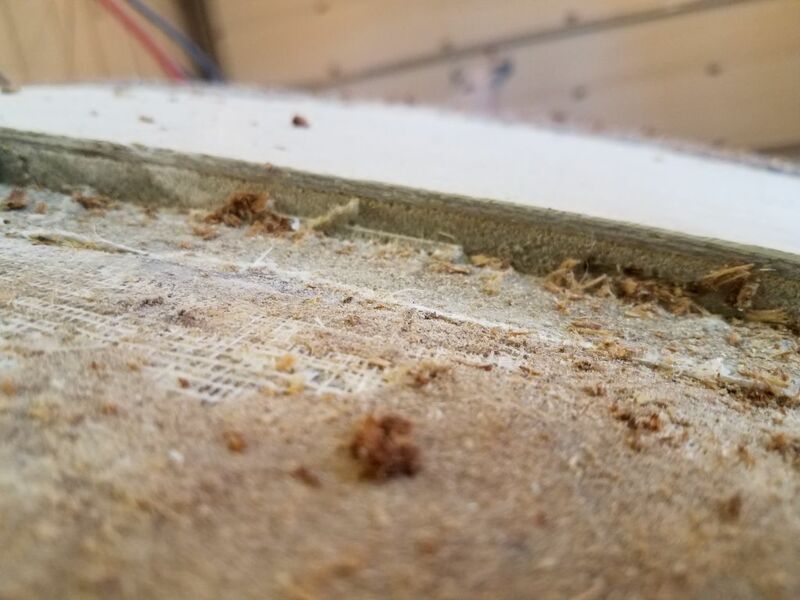 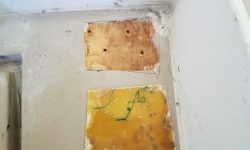 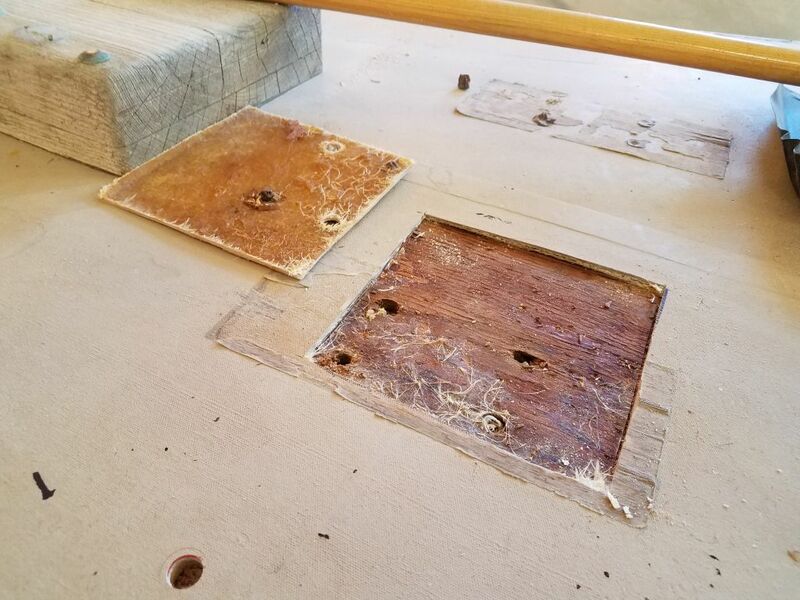 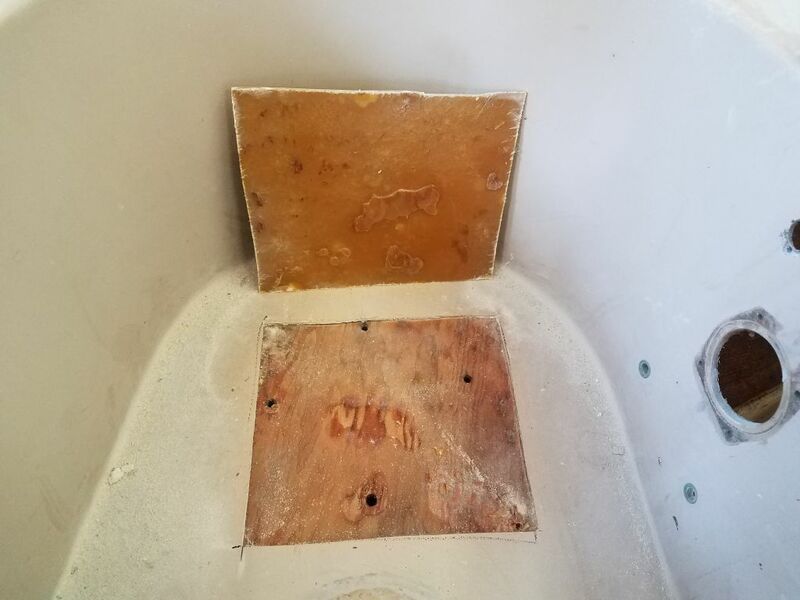 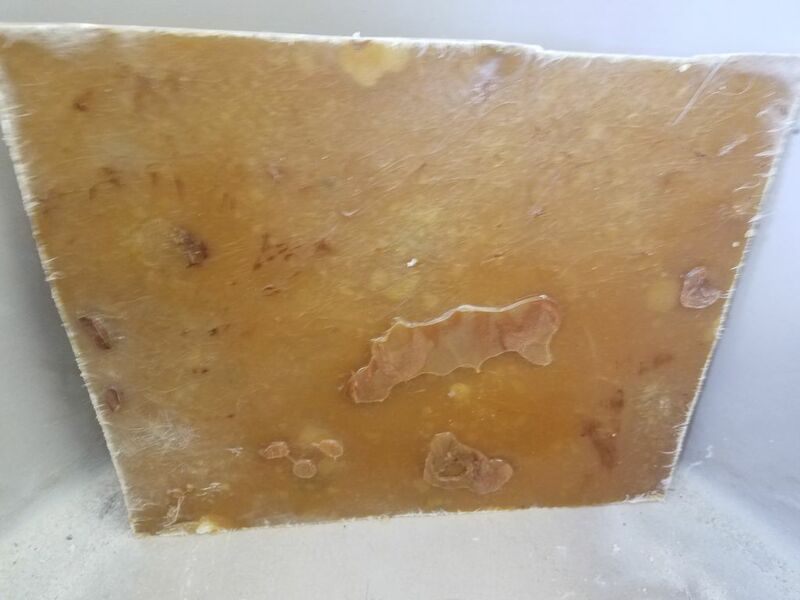 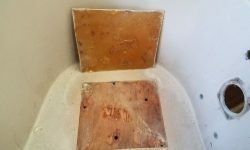 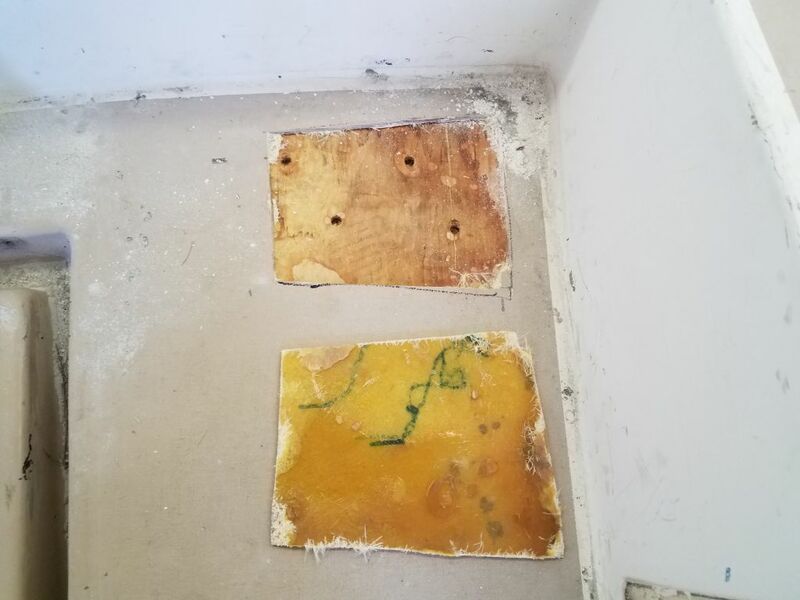 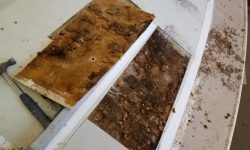 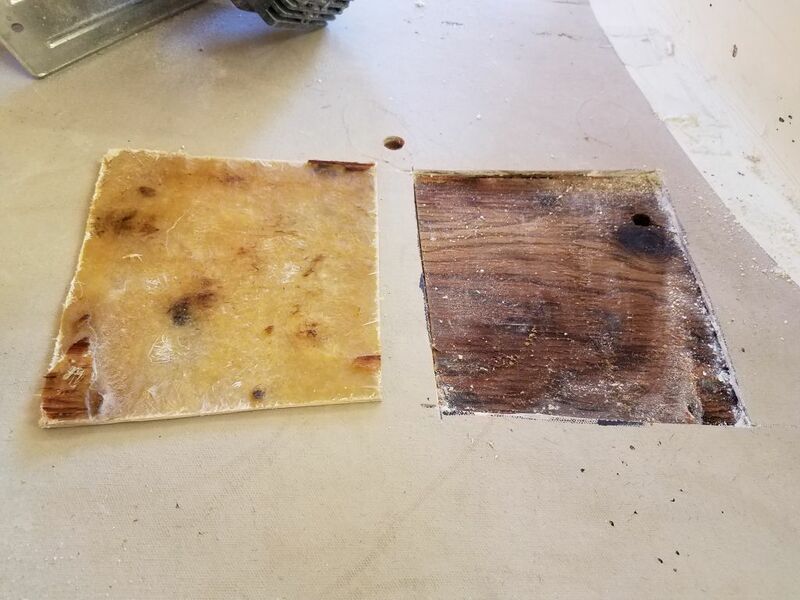 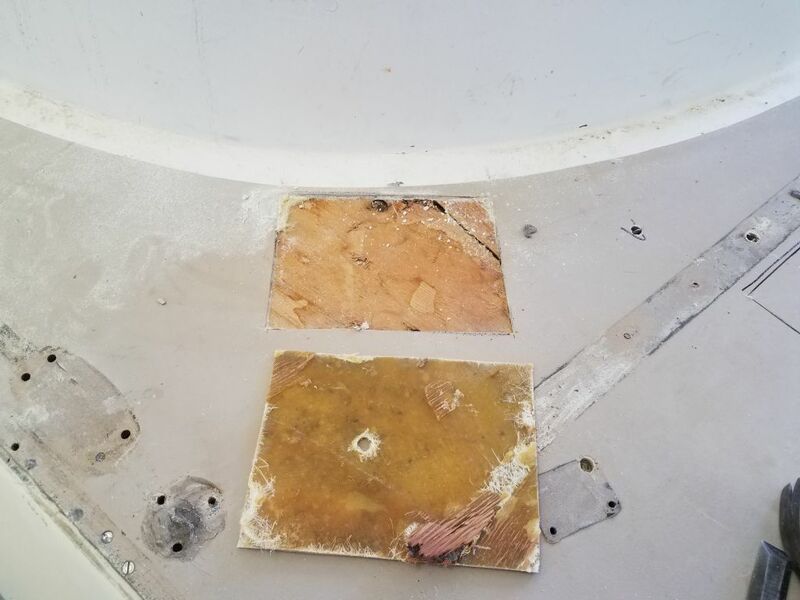 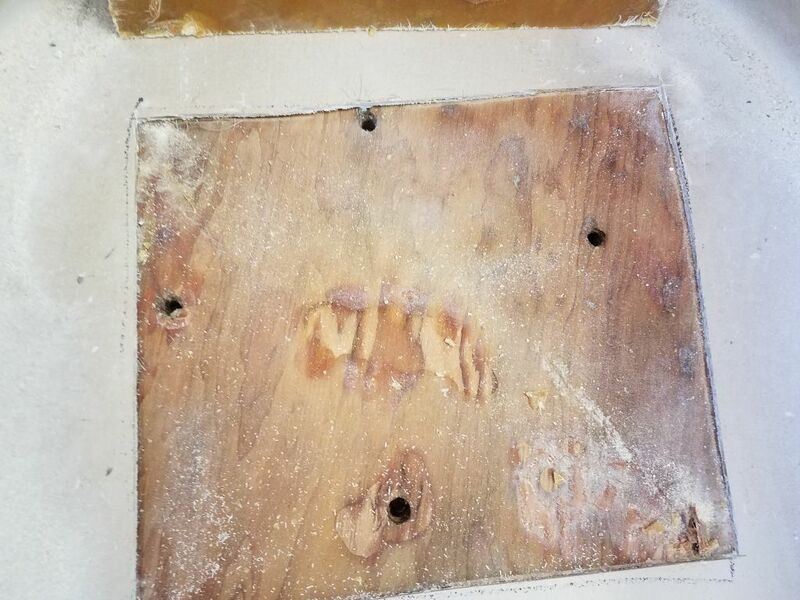 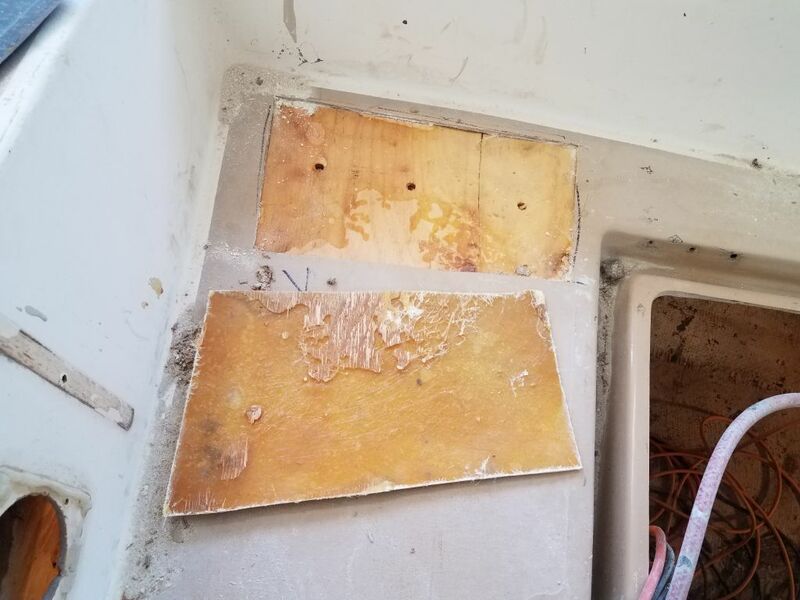 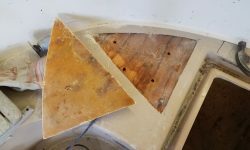 Now I went around and removed the skins from these areas so I could install new fiberglass that might have a chance of bonding with the core, as the original had not. 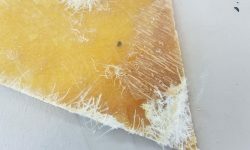 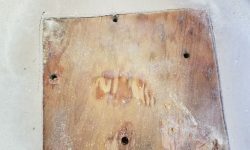 In most cases, when I removed the top skin (with virtually no effort),there was little or no sign of the core ever having been properly bonded to the skin, though in some areas I found small globs of whatever adhesive (resin-based) was used during the original construction to secure the plywood to the underside of the top skin, with virtually no contact between the core and the skin in other areas, so these voids were latent and had been there since the boat was first constructed. 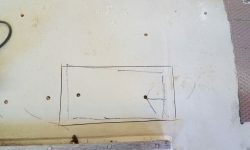 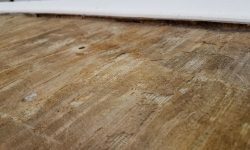 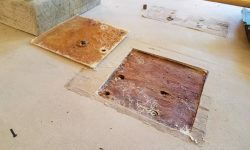 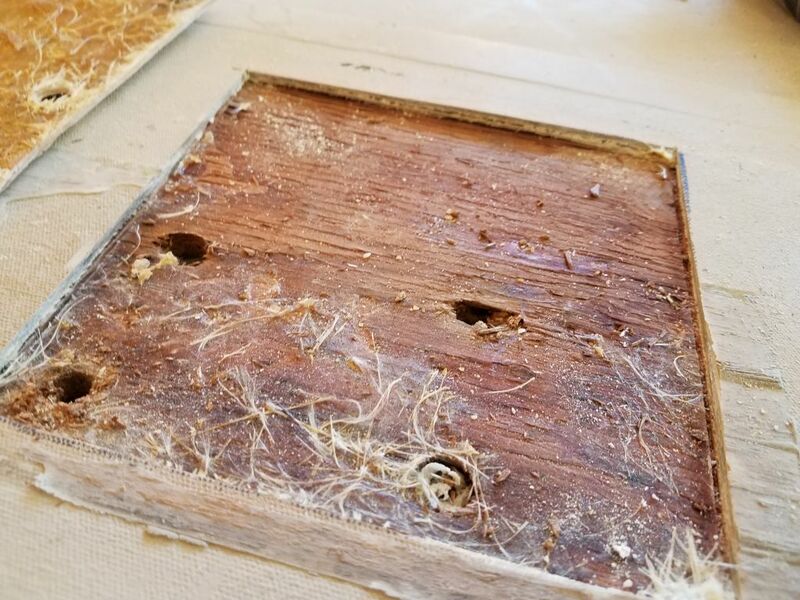 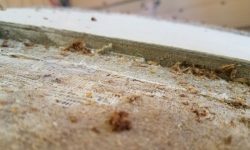 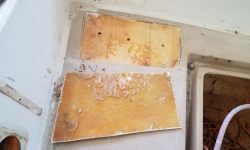 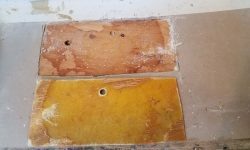 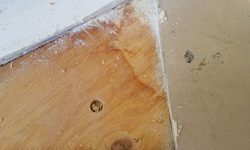 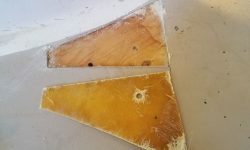 In many areas, I found clean holes apparently drilled into the plywood coring, though for what purpose I couldn’t imagine. 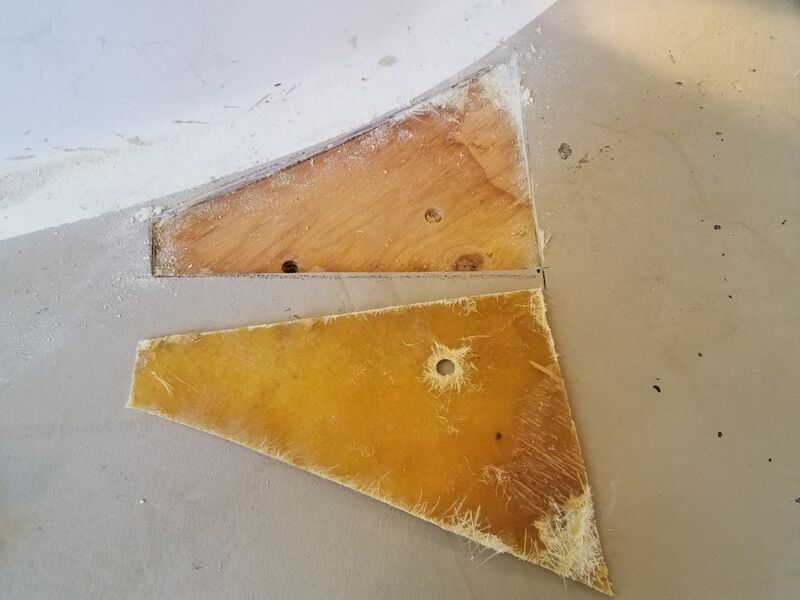 These were separate from the various test holes (and in some cases old fastener holes) that penetrated the core. 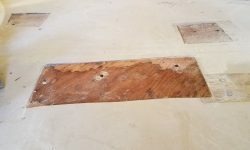 The coring was sound in all areas, and was simply a normal grade of plywood. 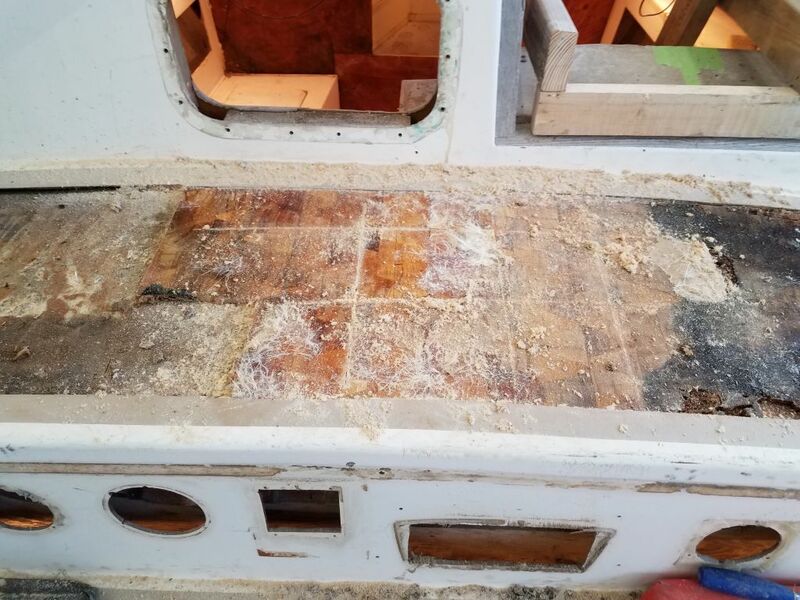 I’d rebuild all these areas with new epoxy top skins in due course. 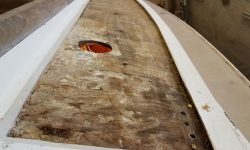 Next, I turned to the wide bridgedeck, where I knew most of the core was in poor condition. 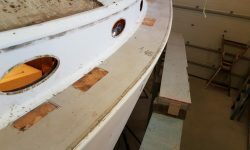 At first, thinking the center section of the deck might be sound, I limited my cuts to the end sections, but eventually decided to remove the entire center section too, since the damage extended far enough in some areas that it just made sense. 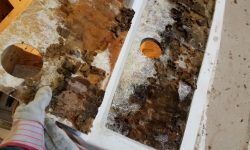 I spent the rest of the day cleaning out the old core from this large section, including around the edges, and cleaning up the spoils from the day’s removals.